'Russell Baby' Accident, High Street, Brentford, 1920s/40s? 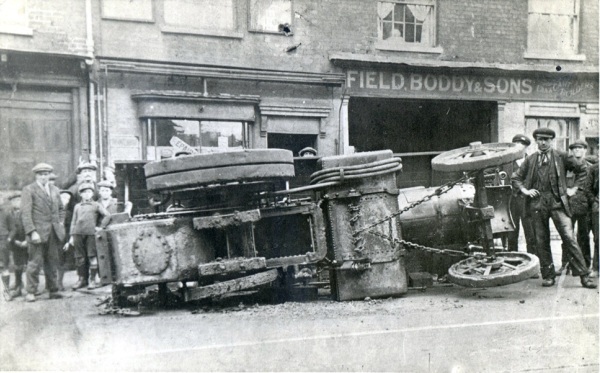 The picture and the traction engine are well known and the engine survives to this day in Kent but details about the incident are sketchy. The back wheel of the engine came off and the engine was repaired and continued to work for many years afterwards so it wasn't that serious. 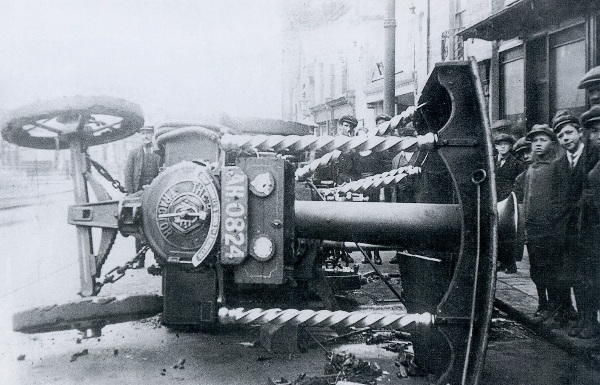 The traction engine was built in 1920 so the picture was taken some time after this. The traction engine was owned by a fairground families firstly on the Isle of Wight then in Southampton, they did travel these fairground attractions extensively so it would not be impossible that they ventured as far as Brentford. The engine would have been used to haul owners living quarters or small sideshows. They are quite fast on the road so a journey to London would have been much less of a task than with some of the other bigger rides in tow. Janet MacNamara noted: it might have been on it's way to a fair on Turnham Green where there are still fairs on some Bank Holiday weekends. Also there was a permanent fair ground on the upstream side just over Kew Bridge until about the 1960s. It was run by a family called Beach but they were different from the jam factory ones. The second photo shows a side view, with Field, Boddy and Sons Ltd in the background. They were at 279 High Street. David adds: the engine was owned by George Baker & Sons Ltd, Southampton at the time and was called "The Russell Baby" (it went to the Isle of Wight and was named "Island Prince" after this incident). The unusual name was after a social scandal of the time, involving the birth of Lord Ampthill, see his obituary from the Telegraph. It is said that Mr Baker had a great eye for publicity and the engine was named after this to generate a bit of controversy and general interest. See Steam Scenes website for steam engine details and images. Can you suggest a date for the incident? If so please get in touch.